I almost fell asleep on the way to pick up my youngest from school 2 days this week. If my tubes weren’t tied and my husband didn’t have Prostate cancer- I’d worry I was pregnant. I’m THAT tired. I also managed to erupt with a staph infection of biblical proportions. (Yup- I was THAT chick at urgent care this week… the one with a giant infection on her face… and toe. Fabulous.) I feel, over all: sick. My eyes are sticky, my mouth is dry. My body hurts. In short: I’m a mess. I’d be asking: “What’s wrong with me?” if I didn’t already know the answer: I’m burning up on re-entry. Re-entry after a week spent pouring it all out and soaking it all up at #MOMcon2013. I did EVERYTHING. I didn’t take “down time.” Before- during or after. I kept thinking: it’s once a year. This is my chance to talk to as many Moms as I can. So I did. It was good. Really good. Then- I came home and hit the ground running. Laundry? Check. Homework? Check. Follow-up? Check. Dinner? Check. And then my body said: I’m done. I have work to do. I also have: a choice. Why? Because sleeping when you’re dead is a bad plan. It gets you deader- faster. Burning up leads to burn out. Burnt out- not very good stewardship of my energy or life. What things wear you out? How do you fill yourself up? Are you fried? Burning up on re-entry? From work? From an event? From mothering in general? From life? I don’t regret a single moment of the time I spent with people last week. I actually WISH I could have connected with more……However- I also wish I would have rested in between- and worn more comfortable shoes. Justsayin. I hope God uses this confession of hypocrisy as an offering of brokenness…. Cause that’s all I got this week. ;) Lord- make something beautiful out of the dust of myself…. I’m a mess, how bout you? Dear Lord- I’m a mess. please help me be wise with my resources- all of them- including ME. My body. Help me not to burn up on re-entry. and help my sisters…. (and brothers) In Jesus name- amen. October Dress Project and: MomCon Preparations! 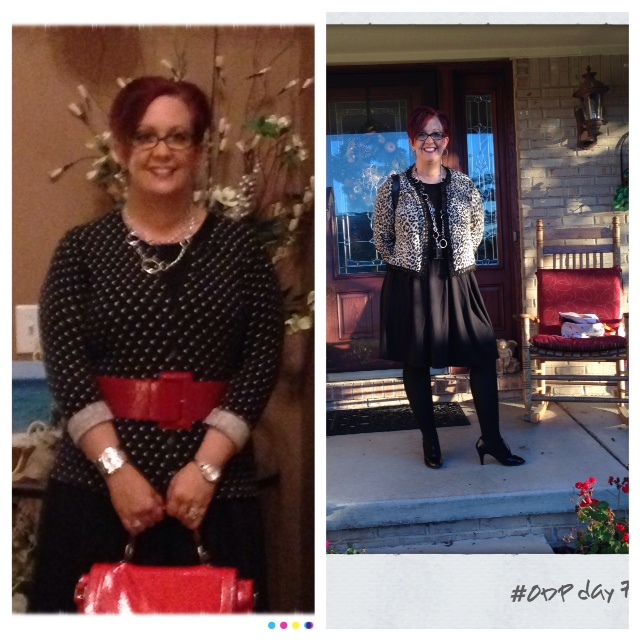 Still wearing “the dress.” The picture shows the past two days. So far, my biggest realization hasn’t been about excess or consumerism. It’s been about my body hate issues. Which: I hate. Both my body and how much I have issue with it. Here’s the thing: I have a pastoral counseling background. I have designed curriculum and facilitated groups for girls to help them with self worth. And I can’t stand to see myself in the mirror- or pictures. I spent years making faces at cameras- cause if I’m going to look bad- it better be by choice. I was always thin as a kid teen and young adult. 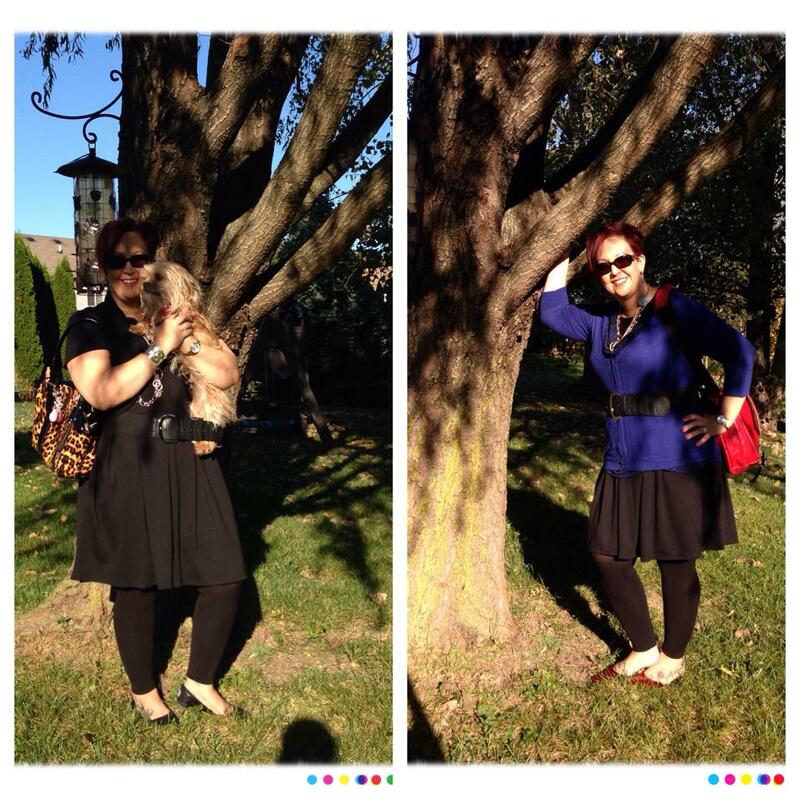 My weight has fluctuated like most adult women through my childbearing years….. Now, I’m not thin. Not “childbearing.” I’ve talked about these issues before. But- this project (and a certain time of the month.) Is really bringing them into view. I’ll be honest. In my brain- I say things like: “I look like a cow.” “I can’t wear colors or prints. I’ll look like a muu muu wearing granny, or a circus tent.” “Bright colors make me look giant.” And worse. I’ve avoided going places because of how I look. I tend to over-dress to compensate. I try too hard and end up looking like it. So this whole- wear a dress for a month and post pics of yourself? It’s not some big “See how cute I am, aren’t I great?” thing for me. It started as a creative exercise. An exercise in minimalism. It’s grown into an exercise in self acceptance as well. My body has been through a lot. I’ve exercised myself into several over use injuries. (Hello, plate in my tibia from the great running escapade, meniscus issues, tendonitis the list goes on…) I tend towards going a bit too hard after goals… fitness has been one of those. I have been through a lot in the past few years. Health, emotionally, etc. I should be glad I’m upright, mobile and functional. I should celebrate that. But- I don’t “feel” it. I “feel” fat. I “feel” ugly. 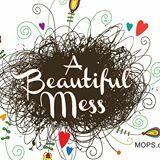 A few weeks ago- I had the honor of speaking at a MOPS group about the beauty of “sharing our messes.” Our authentic- not covered up or pinterested selves. During the talk- I stripped away my “speaker clothes” (AKA: security blanket) and was wearing my “real mom clothes” underneath. Nasty yoga shorts circa 2007, yoga tank that has never seen a yoga studio and my favorite fluffy scruffy slippers. My thighs (and more) showed, stretch marks and all. The moms connected. They got it. I got something too……probably more than they did. Guess what? They were no less attentive or connected with the talk when I was wearing my mom “gear” than they were when I was wearing my “speaker” gear. It wasn’t about ME. How I look. Etc. It was about the message I was communicating. Maybe- it always is. Maybe, I’ve made clothes and trying to look thinner too much of a focus. By making the focus “looking thinner” I’ve pretty much forgotten that clothes should be an expression of who I am on the inside. I’ve forgotten that they DO send a message before I open my mouth. but they aren’t THE message. Actually- as my only prerequisite for an outfit is: does it make me look thinner/ fatter? I doubt they’ve been saying much about ME at all. I don’t think anyone who knows me would say that the color they think of when they think of me is: black. 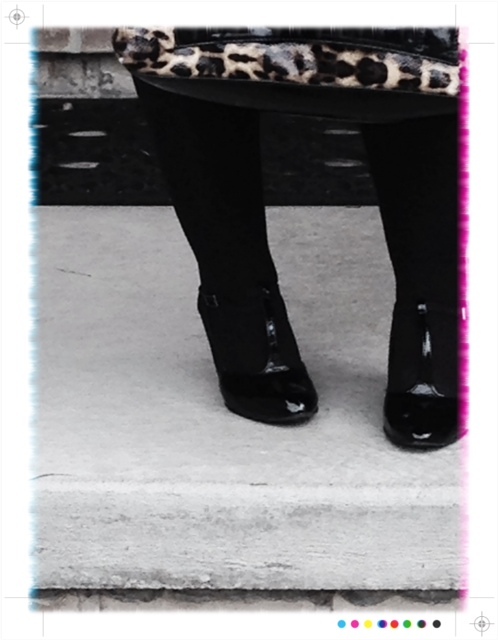 (But leopard print? Maybe.) I’m an extrovert with introvert tendencies. I smile easily and love people. I’m that annoying chick who facilitates or starts conversations in the elevator. And the bathroom. And Target. That doesn’t exactly scream: black. Funny how I start with a plan and God comes along and changes things up! How do you choose clothes? By style? By how you look in them? How you feel? By price? How do you feel about seeing yourself in pics? In the mirror? How do you talk to yourself about your appearance? What kinds of things do you say? Let’s talk about clothes. When it first came out- I read Jen Hatmaker’s book- “7.” A year ago some friends and I started a journey through the bible study that followed the book. Once I got past my deep annoyance at Jen Hatmaker for pushing my buttons and stopped making excuses… it changed my outlook and daily life. I think more about how I live and what I choose to invest my life, money and energy in. I also gave my “years in the making” excessive wardrobe a pretty harsh cutback. I donated more boxes of clothes than I care to admit. I started thinking through new purchases on all levels. The subtitle of Jen’s book is “A Mutiny Against Excess.” Which- I was pretty sure I didn’t have.. I mean… We’re not rich, and I’m a mom…. I drive a used car, I buy Target clearance- everything….Almost. I splurge once in a while.. but excess? I just didn’t see it. We are also pretty quick to help and give when and however we can… I thought the balance was pretty even. “Thought” is the operative word, there. Fast forward a year. Honestly? If I graded myself I’d have to say a solid C+. Which means- a bit above (my) average. I let life crowd out a lot of the changes that I was opened to. I got lazy. I got sick. I had surgery. Hubby’s cancer refuses to vacate the premises and I blamed it for some of my choices this past year…. more dinners out because of convenience. Clothes, food, book and media splurges as (ineffective) coping methods. (That’s my list of immature coping skills.) My closet isn’t as overflowing as it was…. But. it’s grown. I signed up. 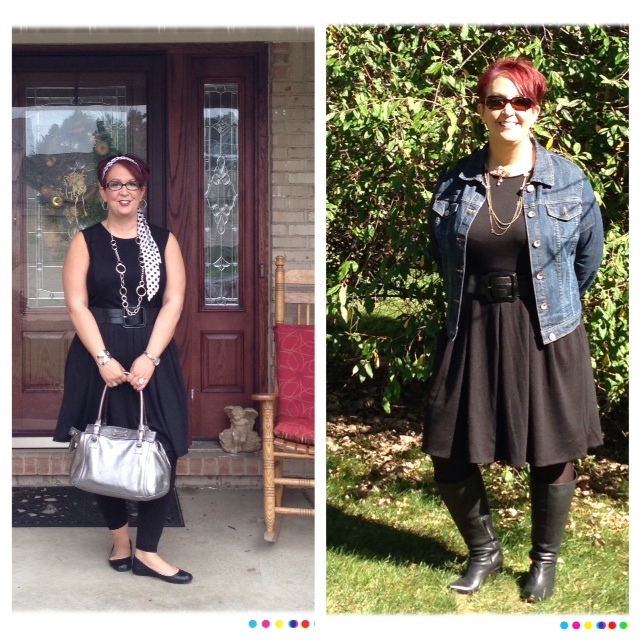 The premise: one dress- for 31 days. Washed as much as you like. Accessorized however you like. But worn for at least part of each day. For the month of October. Today is October 9- I’ve worn it 8 days. Kind of. In typical Tracey fashion- I decided to commit to the dress project at the last minute. (A day late, actually.) Which means, I ended up in the fitting room at my local Target Trying on every black dress in my size and making a decision (or so I thought) in 45 minutes before I was due at my youngest’s school for pickup. Time pressured shopping is always bad. TIme pressured shopping for something you’ll wear everyday for a month? Very bad plan. I ran to the front and bought the dress I thought had looked the best. I got home- ripped off the tags slipped it on like the LBD maven I was sure I would be….only to realize that 10 black dresses in the fitting room all look pretty much the same. I’d bought the wrong one. I wore it for 3 days, before I decided there was no way I could wear it for a month without going crazy. I switched it out. It looked and felt like a maternity dress. Which would be fine if I were pregnant. Or even, fertile. Which, I’m not. As a Work at /from home Mom- I have a lot of flexibility, as far as wardrobe goes. I also face a lot of dichotomies in dressing. I may be speaking in the morning and cleaning toilets in the afternoon. Toss in church, funerals, kiddo football games, conferences, meetings, errands, weddings, MomCon and my 25th wedding anniversary all taking place this month? Well.. let’s just say I’ll stick with it as much as possible. 1) Seeing myself in pictures is uncomfortable. However- I look different “in print” than I do in my head. In my head- I’m hugely fat all over. In real life? Average. When I’m forced to look at how things I’ve bought, fit? I tend to buy: too big. 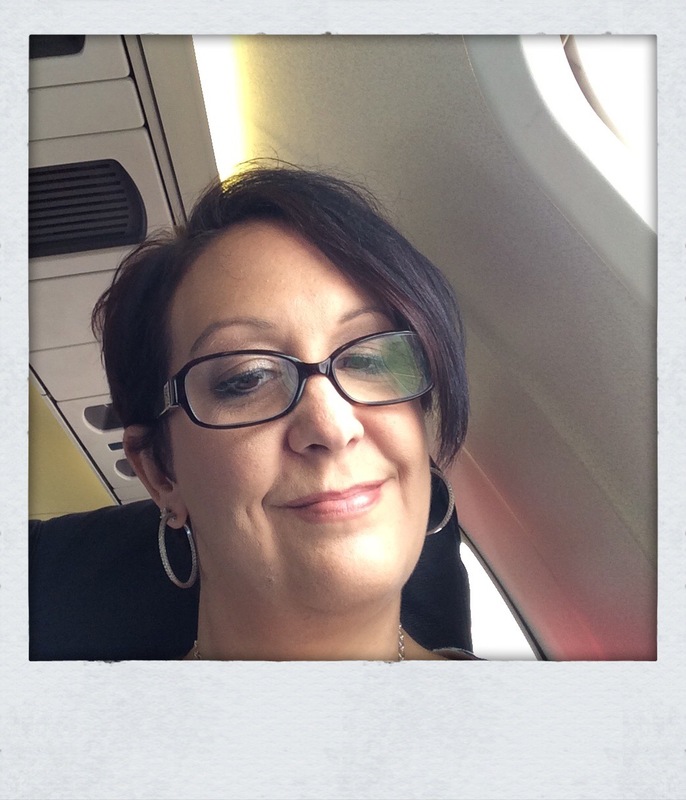 (Except for bras… hello- I got fitted in honor of my first mammogram… guess what? The girls look better in the right size bra.TMI, but true.) I’m learning it’s important to find things that fit. That means: trying them on. WHich is hard when you avoid pictures and mirrors. Which: I confess, I do. 2) It’s not as hard as I thought. a) No one cares what you actually wear. b) it’s fun to try and think outside the box of how I usually dress. 3) It’s harder than I thought. 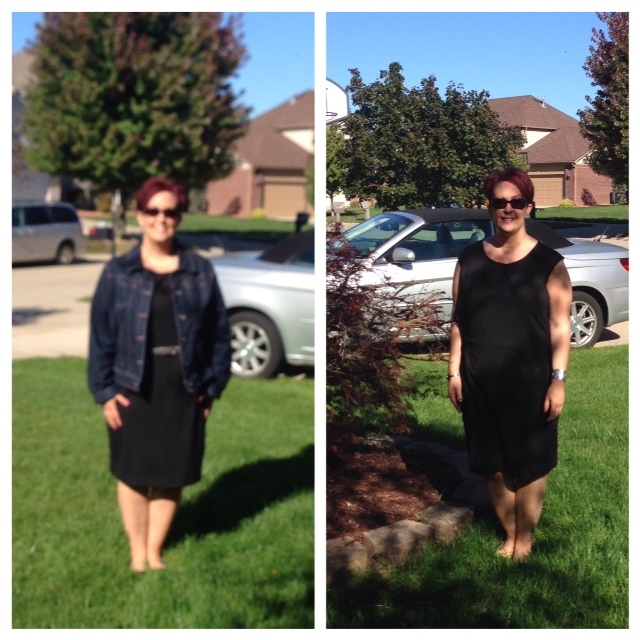 one dress can be worn many ways- but its still the same dress. The dress I settled on has limited some of my options because of the high- round neckline. hard to layer without bulk. Layers= options. 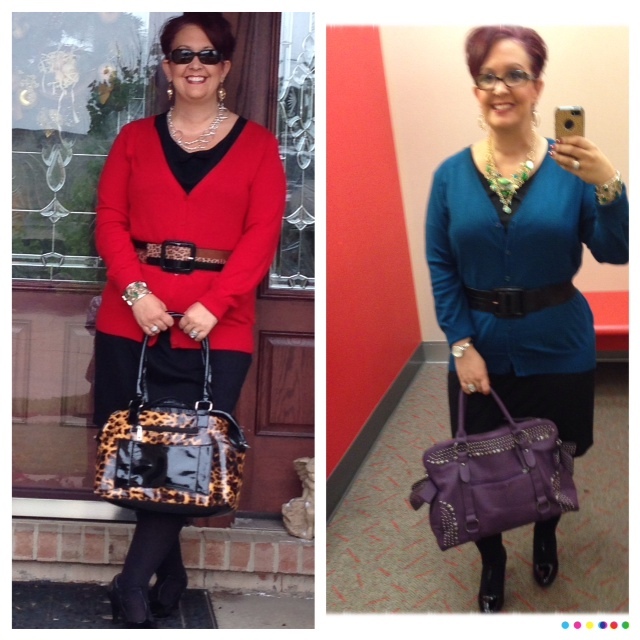 For me- perfect would be a short sleeved or sleeveless wrap dress….maybe next year. One switch is all I’m allowing myself. 4) I could never do this in the summer. TOO SWEATY. 5) I still have too many clothes. Too many shoes. Too many bags. More paring down is ahead. I’m busy getting ready for MomCon next week- an amazing time of “seeing” the moms I love serving in MOPS. I love the training, connection and opportunities it offers. If you’ll be there- I hope you’ll let me know- I love to meet you!